James Cagney is simply great as the Captain of the ship, a little man in size and soul who makes life aboard tedious and unbearable for the men under him.Audiences will enter whole-heartedly into the sailors' conspiracy against Cagney and enjoy thoroughly the comedy that results. 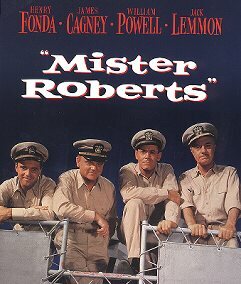 Mister Roberts was originally a hit on the Broadway stage. Henry Fonda re-created his stage role for the film. Cagney blended humor into the otherwise one dimensional part of the Captain. William Powell played doc and Jack Lemmon began a whole career out of his role as pulver. It was filmed on the South Pacific island of Midway and aboard the U.S.S. Hewell. Director John Ford became ill while filming and Mervyn Leroy completed the film, both received screen credit, nominated for three academy awards including best picture, Lemmon won for best supporting actor. Before it's release Cagney, Fonda and Lemmon re-created scenes on the Ed Sullivan Show"Toast Of The Town"